ARRA News Service: What Silver Lining? 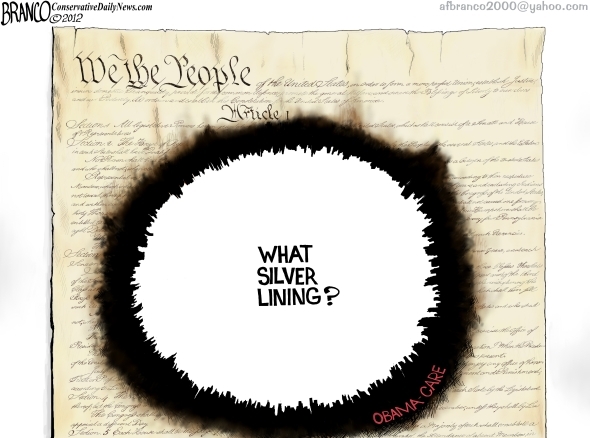 Tags: AF Branco, What Silver Lining, Obama Care, Constitution, hole in constitution To share or post to your site, click on "Post Link". Please mention / link to the ARRA News Service. Thanks! Right!! What Silver lining? It's time Americans took a stand. There's a book out about Americans, in a small town, that do take a stand & it's a great read cause it's about each of us doing something. I recommend it. Congress only has a 7% approval rating & yet they continue to ignore the people's wishes. It's just wrong. To be fair, Obamacare was passed in the dark of the night by a DEMOCRAT controlled House, Senate and White House. The people responded in 2010 and changed the House and made changes in the Senate. This election they can change the Senate and remove the ObamaCare advocate from the White House. The question is --- will they do it?